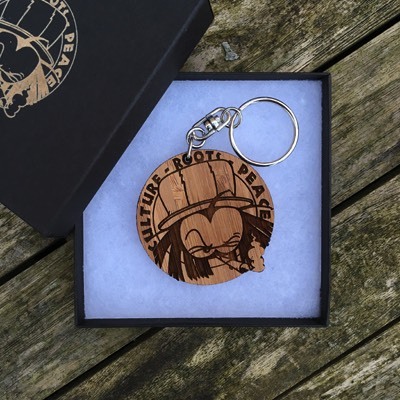 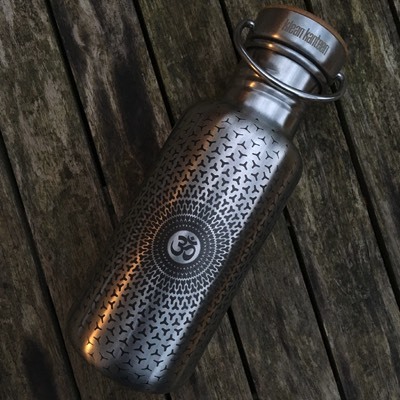 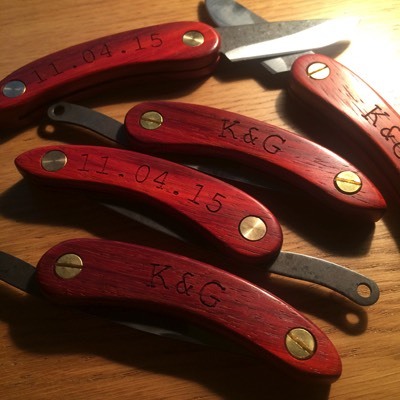 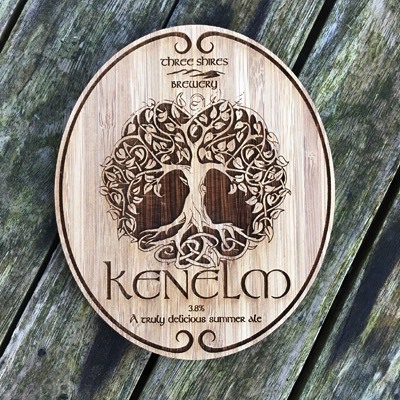 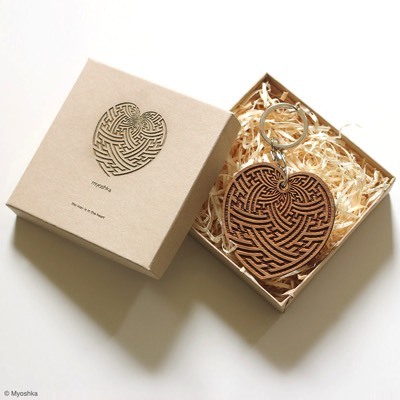 It's not only laser engraving and laser cutting we do at Clear Cut, we also offer branding and merchandising services and can source and personalise a whole range of products for you. 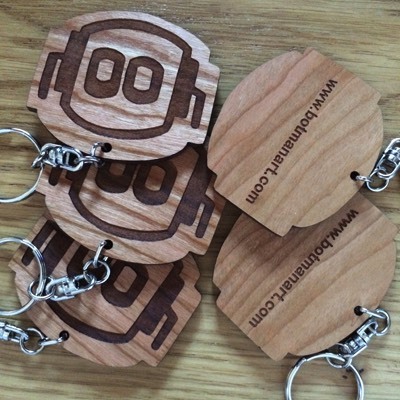 Using our extensive network of manufacturing contacts we can offer extremely competitive pricing on many items for branding and merchandising your brand. 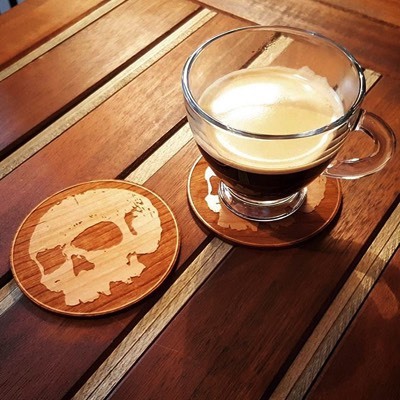 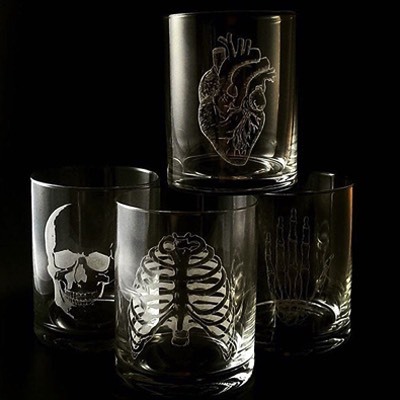 We use both laser engraving technology and also conventional printing and can apply your design to anything for a total branding and merchandising solution. Below are a few of the products we have branded for our clients. 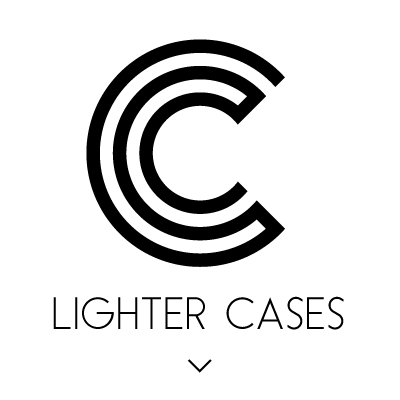 This list is by no means exhaustive, if there is something you would like us to source, get in touch and we will do our best to come up with a cost effective quote for you. 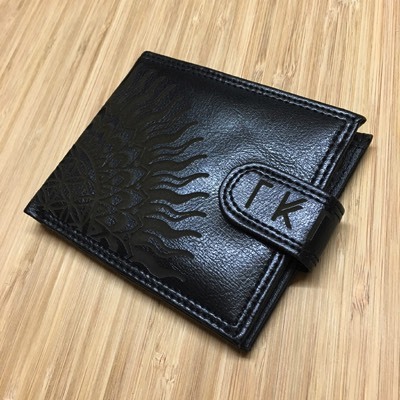 If you have products already purchased, we are also more than happy to work with those although we ensure the products we supply are perfect for laser/print branding and merchandising. If in doubt about what to get just give us a shout and we will be happy to help. In our experience every job is slightly different so do not have a standardised price list. 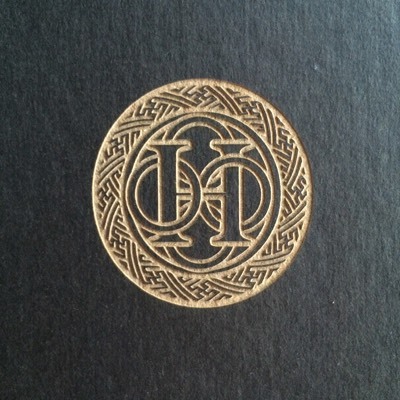 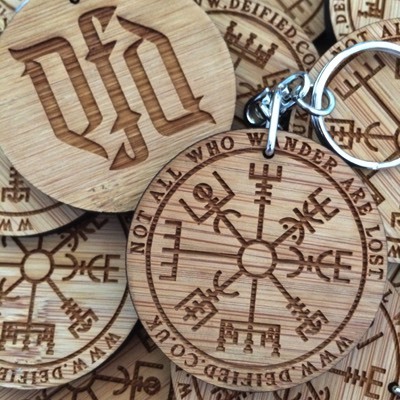 Our pricing is based on how long the project will take to complete, quantity of items and the type of material being laser engraved. If we need to spend time on the imagery to make it into a laser ready format that too can have an effect on price. We are happy to do ones offs and small runs as well as being equipped to fulfil larger production runs if required. 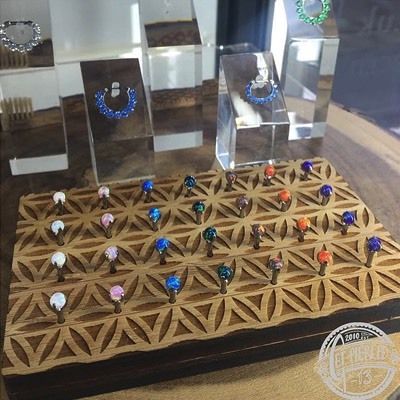 Below is a small selection of our work, for more information get in touch on 07966 375322 drop us a message from our contact page or social media links for more information and a chat. 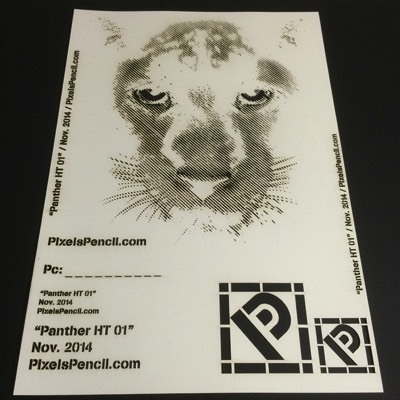 Clear Cut Creation, here to help with your branding and merchandising needs. 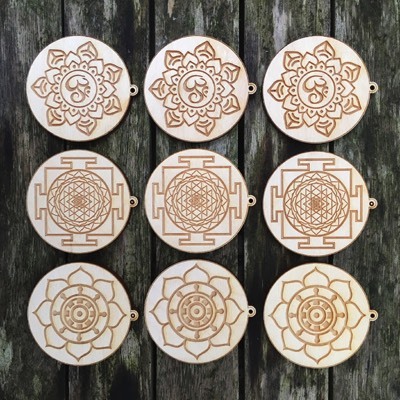 Natural birch key chains with auspicious symbols. 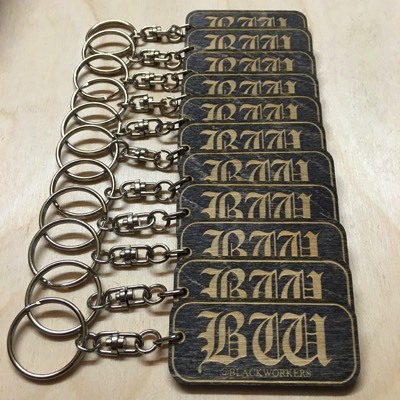 Stained black birch key chains. 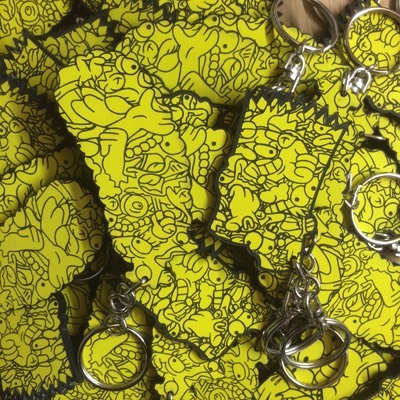 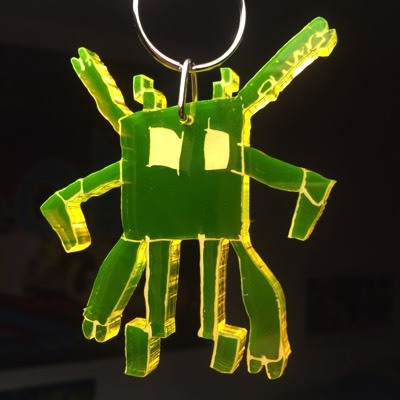 Unalome keychains in bamboo, neon and clear Acrylic. 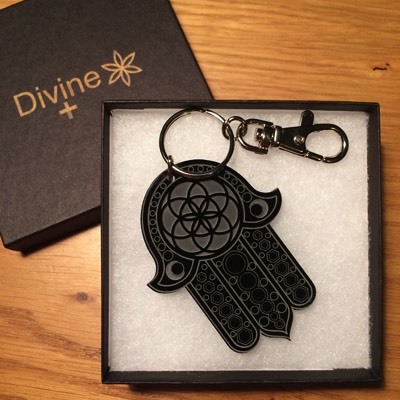 Acrylic keychain with box etch for Corey Divine. 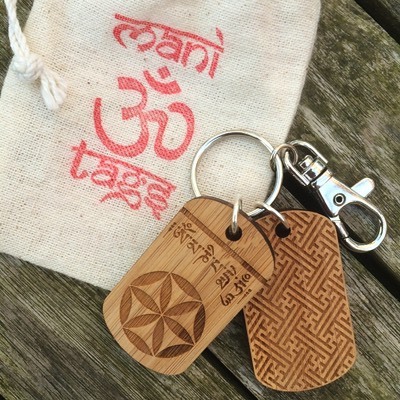 Bamboo keychain and box etch for keychains. 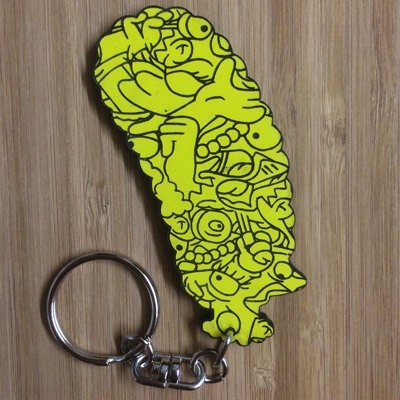 Two colour engraving laminate keychain etch. 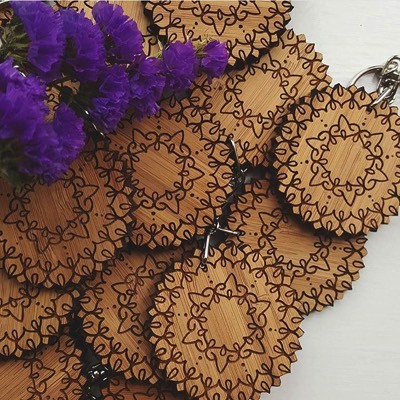 Bamboo keychains with printed bag. 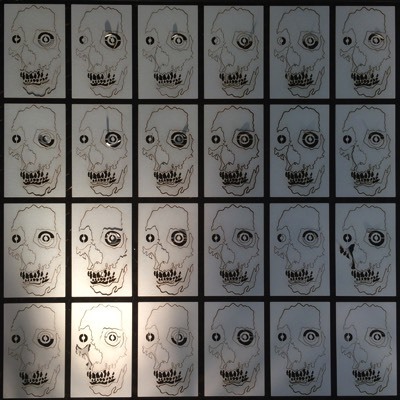 Children’s drawing digitised and cut from neon acrylic. 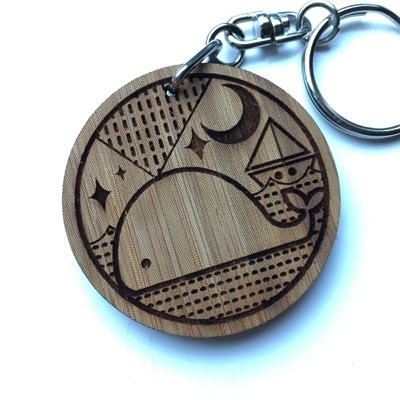 Bamboo deep etch key chain. 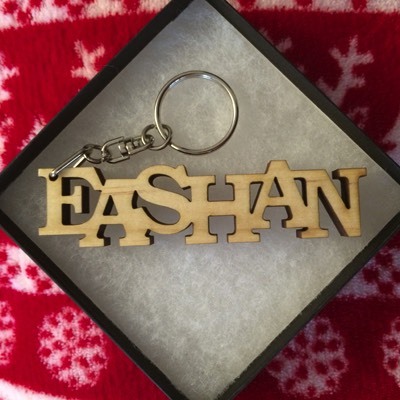 Bamboo keychain and box etch. 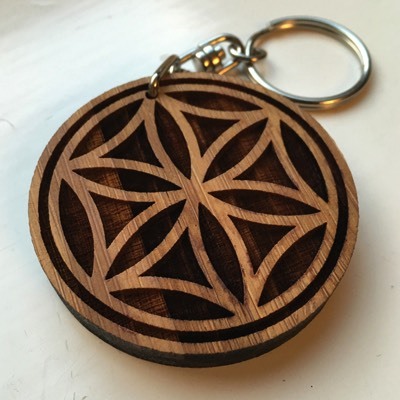 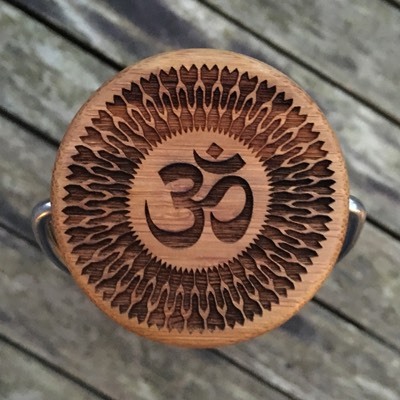 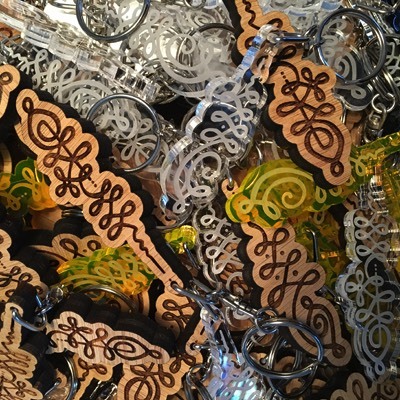 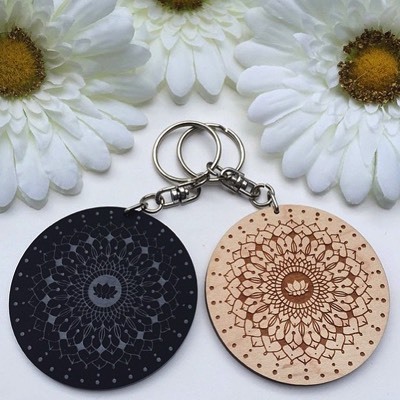 Laser wood and acrylic keychains with mandala etch. 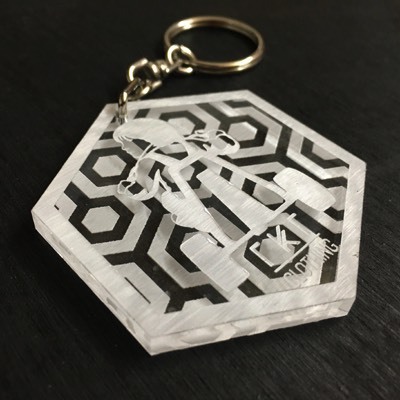 Double sided clear acrylic keychain etch. 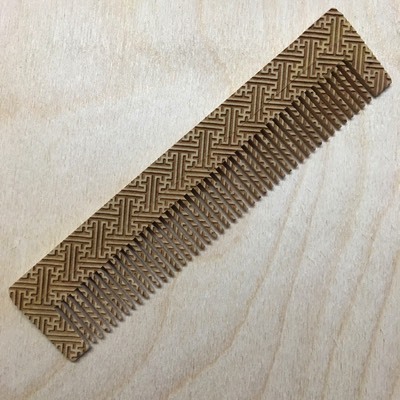 Bamboo comb with sayagata pattern etched. 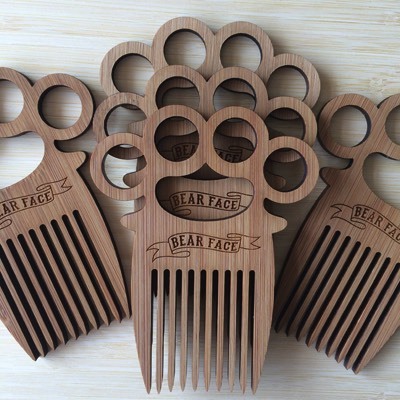 Duster combs cut, etched and hand finished for Bear Face. 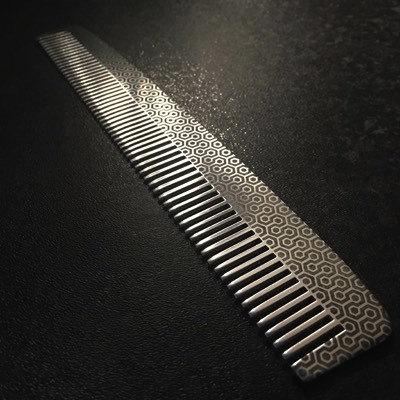 Metal comb supply and marking. 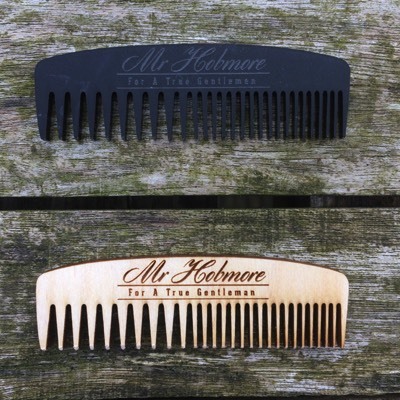 Birch and black acrylic moustache combs cut and hand finished. 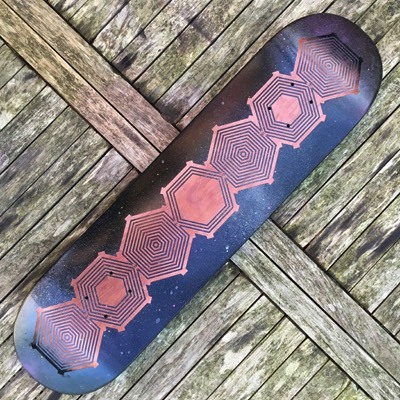 Sprayed skate deck with geometric pattern etch. 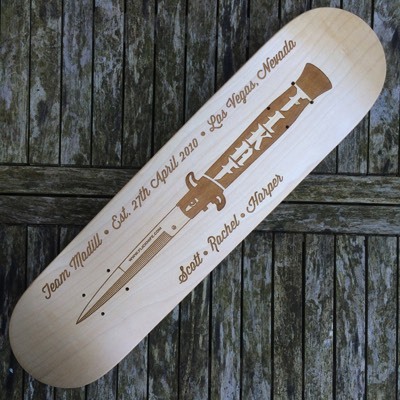 Natural skate deck with name etch. 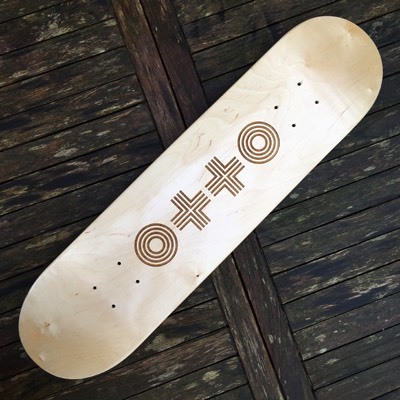 Natural maple skate deck with shop branding. 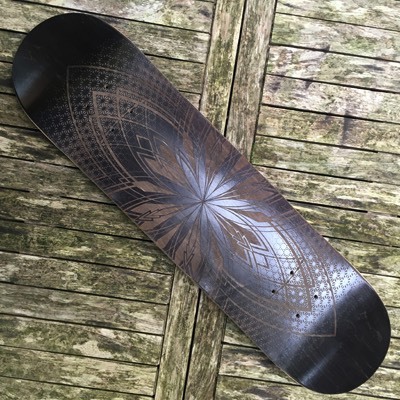 Black maple skate deck etch. 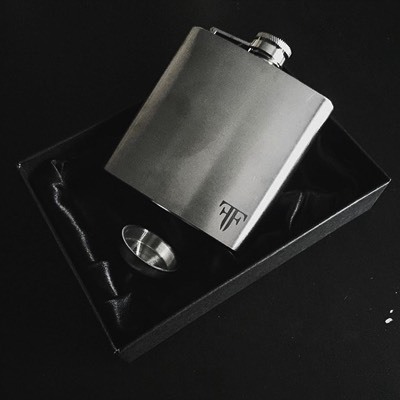 Hip flask with discreet branding for Fellow Extinguished Gentlemen. 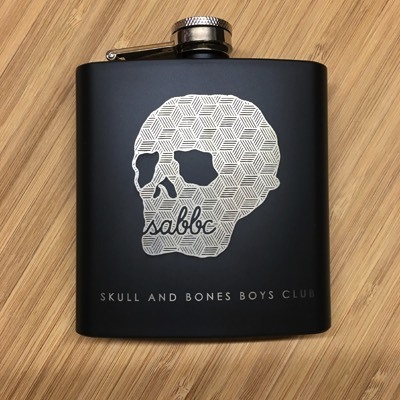 Matte black hip flask etched silver for Skull and Bones Boys Club. 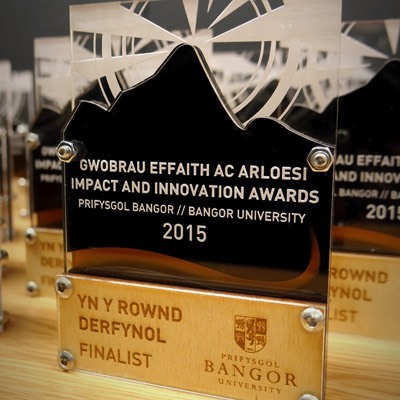 Multi layered, mixed material award trophies. 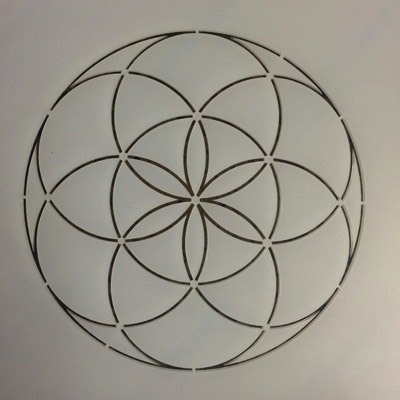 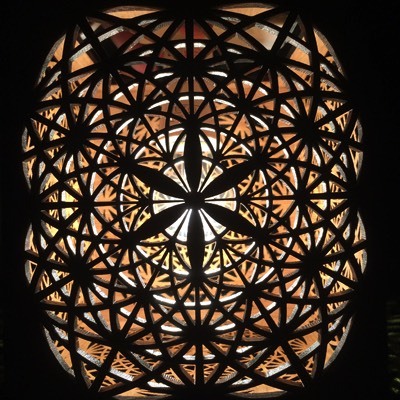 Bamboo jewellery rack with Flower of Life pattern etch for Get Pierced. 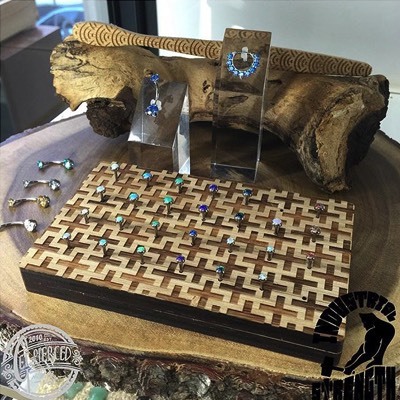 Bamboo jewellery rack with Good Cross pattern etch for Get Pierced. 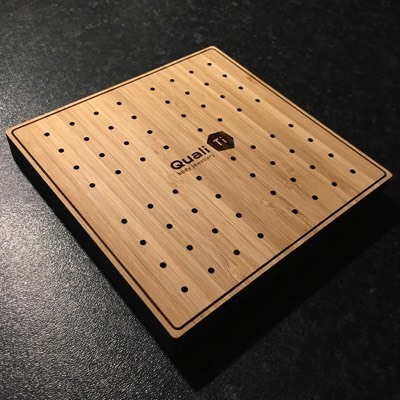 Bamboo jewellery display stand for Quali Ti. 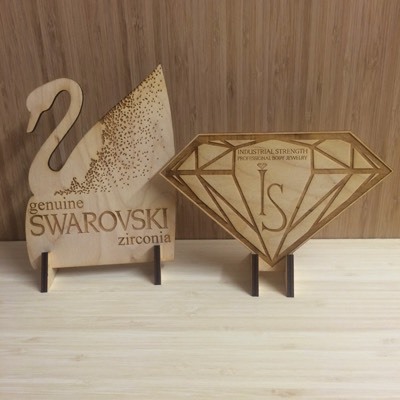 Swarovski and Industrial strength display plaques. 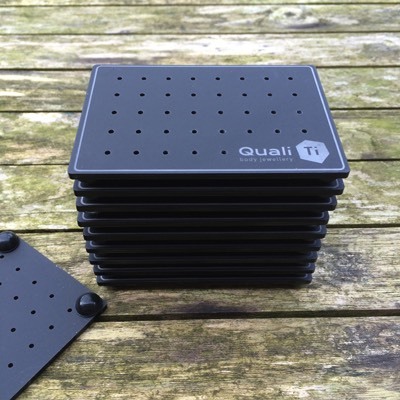 Matte black acrylic display stand for Quali Ti. 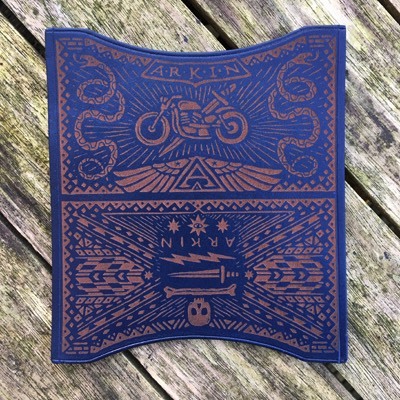 Intricate leather etch for Arkin Supply to be made up into wallets. 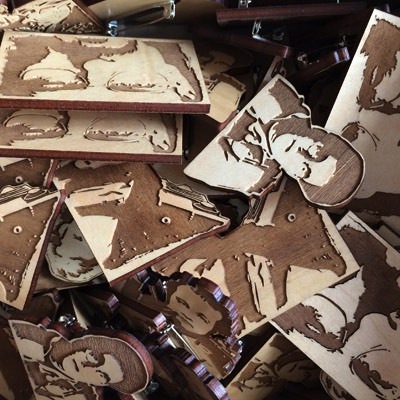 Laser wood badges for an illustrator client. 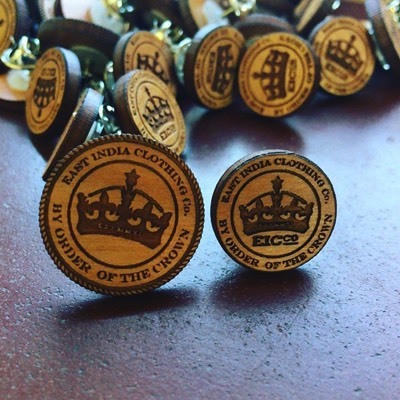 Tiny laser wood pin badges for East India Clothing Co. 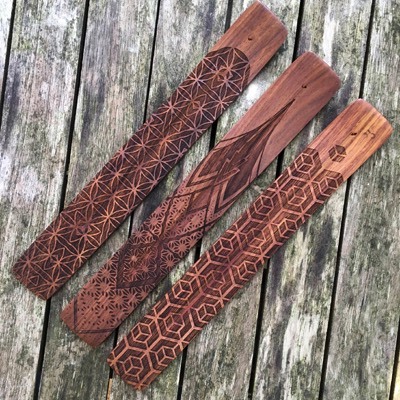 Traditional incense holder etched with geometric patterns. 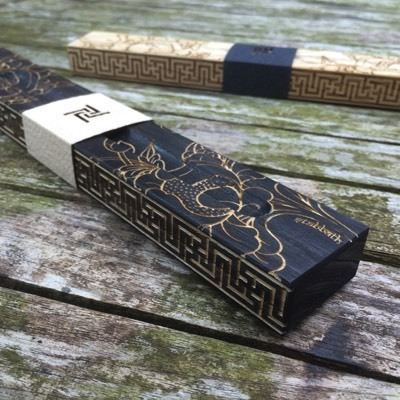 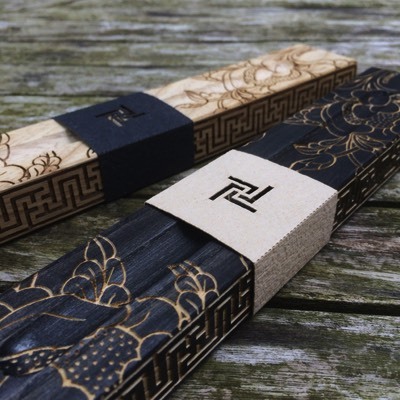 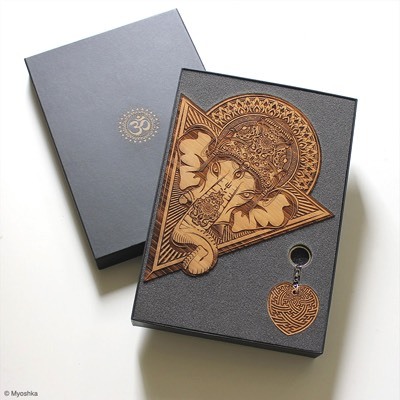 Solid Ash wood premium incense holders. 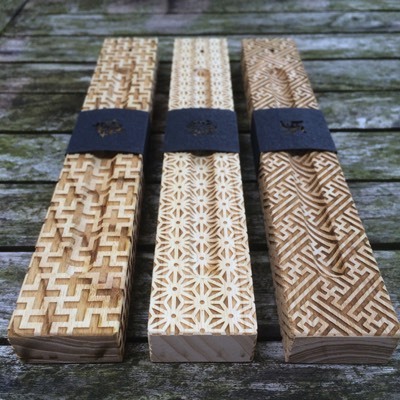 Solid Ash wood premium incense holders in natural and stained finish. 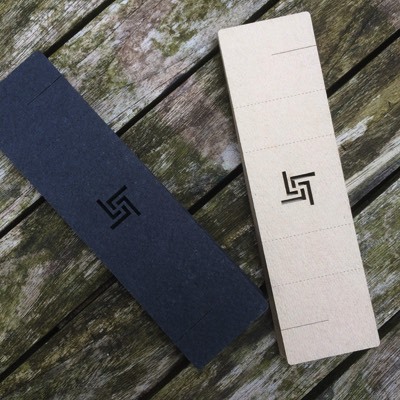 Double sided super thin birch plywood loyalty cards. 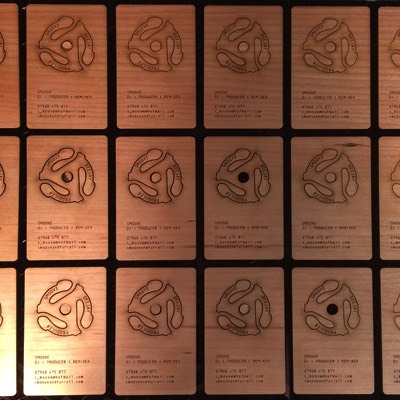 Wooden business cards featuring pop out 45 record adapter for DJ Smoove. 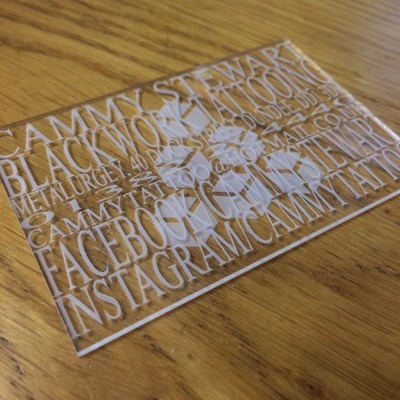 Double sided clear acrylic business card. 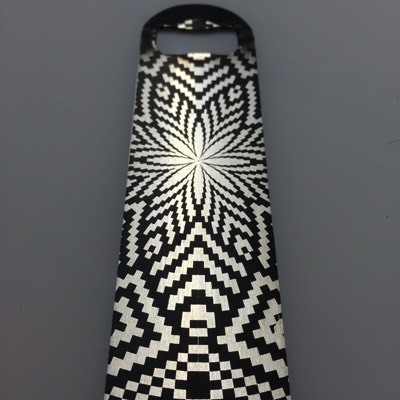 Box and foam etch for art packaging. 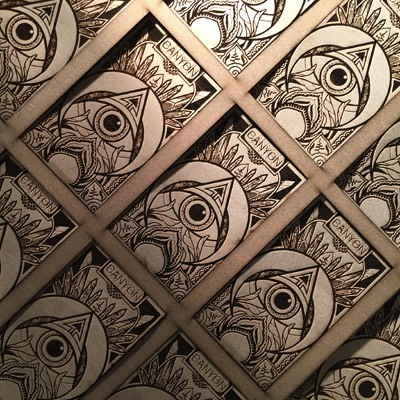 Handmade Indian rag paper cuts for incense packaging. 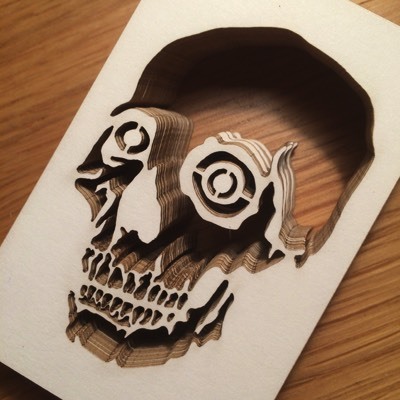 Box etching for Hannah Pixie Snowden. 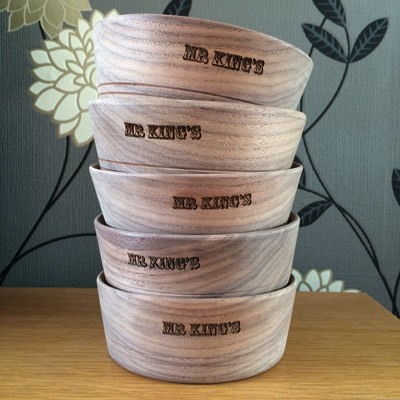 Walnut bowl etch for Mr Kings Marvellous Moustache Wax. Bamboo bar clip for the Three Shires Brewery. 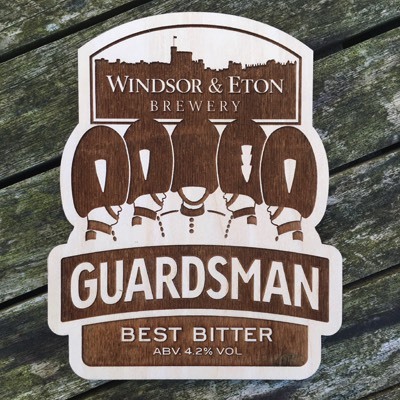 Natural birch bar clip for Windsor and Eton brewery. 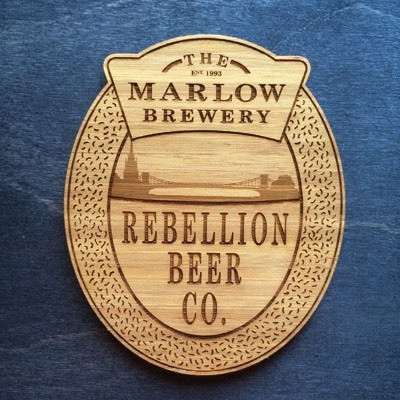 Bamboo barclip for Rebellion brewery. 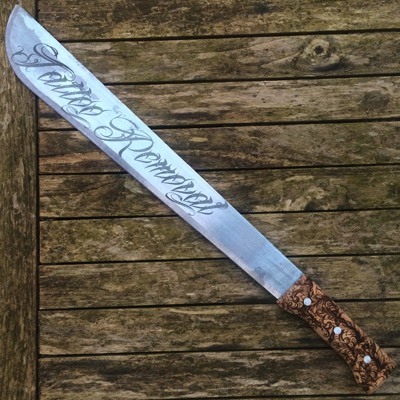 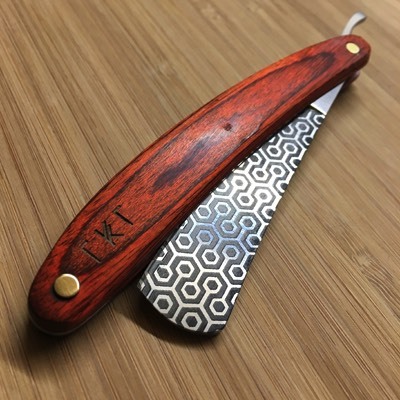 Rosewood handled cut throat razor with blade etch. 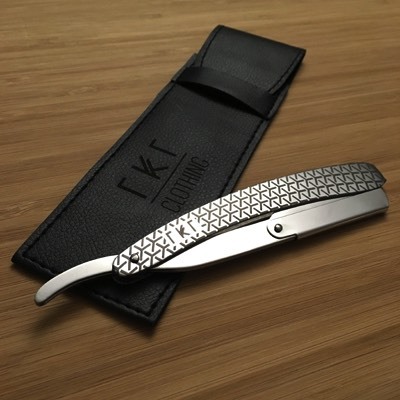 Cut throat shavette etch complete with branded pouch. 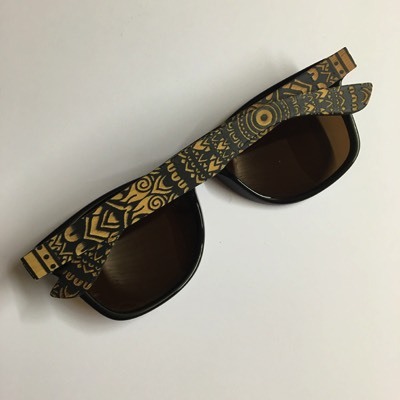 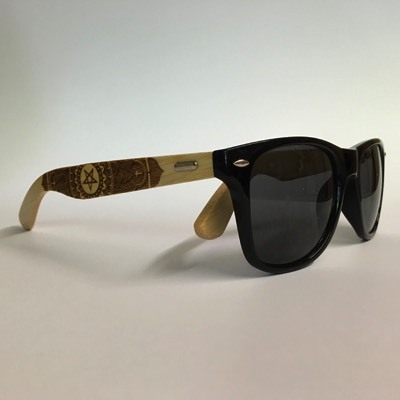 Sunglasses bamboo arm etch for The Killing Tree Clothing. 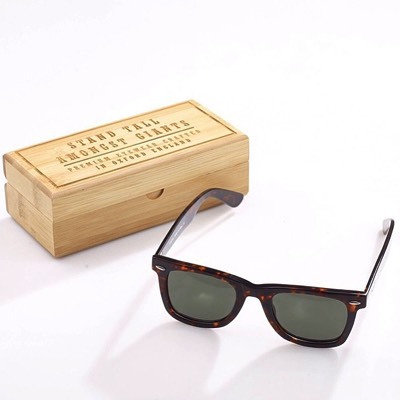 Box and glasses arm etch for Stand Tall Against Giants (S.T.A.G). 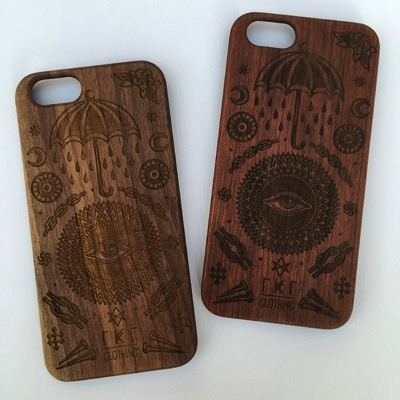 Phone cases in Rosewood and Walnut for The Killing Tree Clothing. 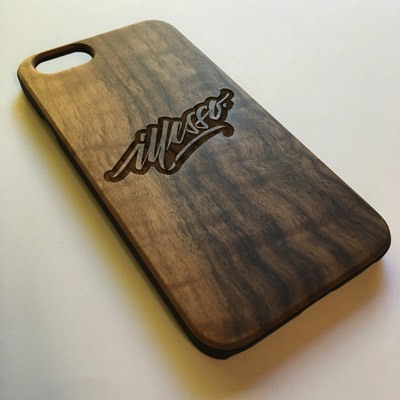 Walnut mobile phone case with branding. 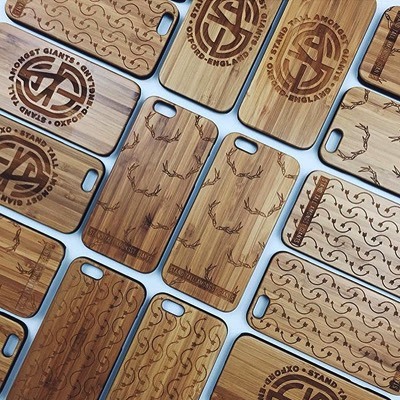 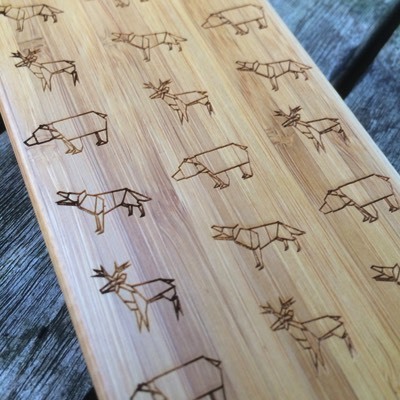 Selection of bamboo phone cases for Stand Tall Against Giants. 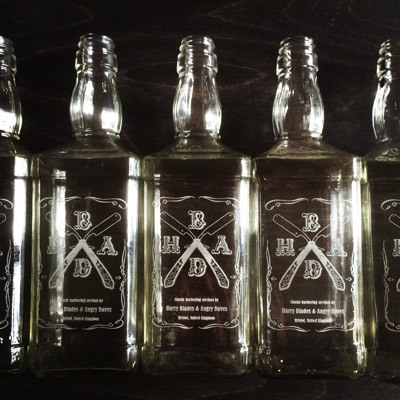 Custom Jack Daniels bottle etches. 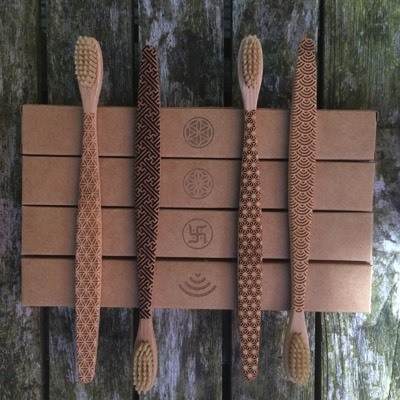 Bamboo toothbrush complete with card box. 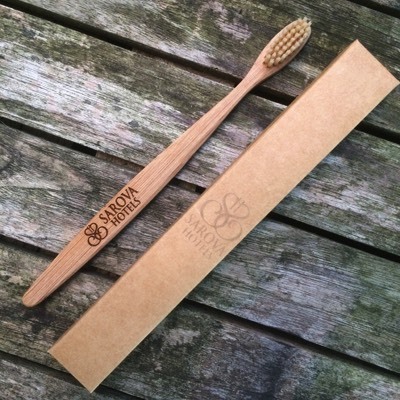 Branded bamboo toothbrush complete with card box. 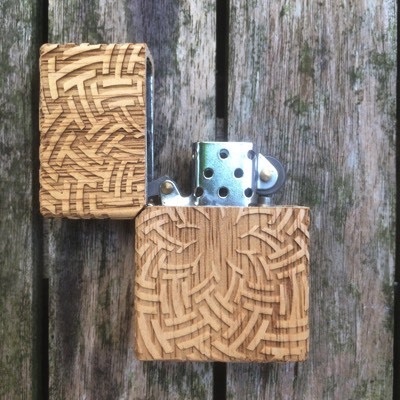 Zippo lighter wood case etch. 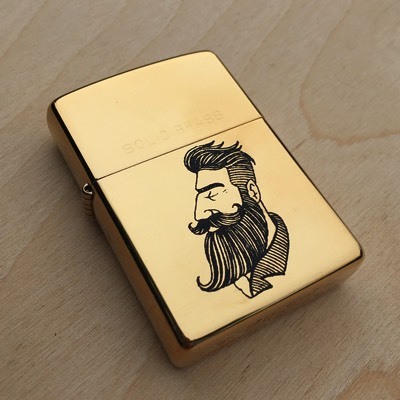 Brass Zippo lighter metal marking. 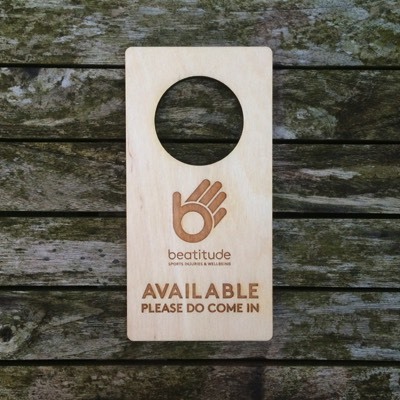 Door handle sign in birch. 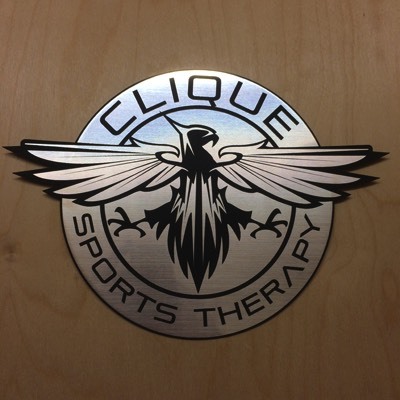 Door sign in brushed aluminium effect laminate. 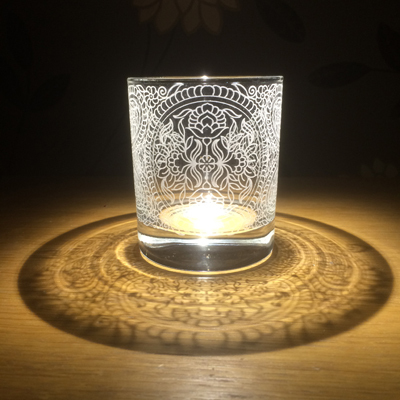 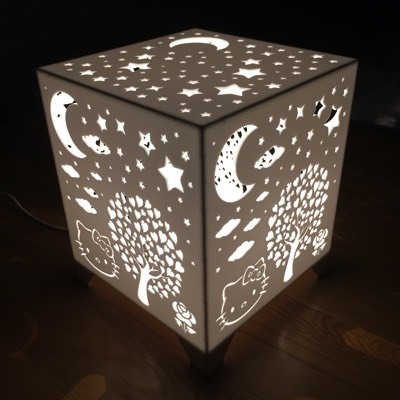 White acrylic lamp cut to display shadows. 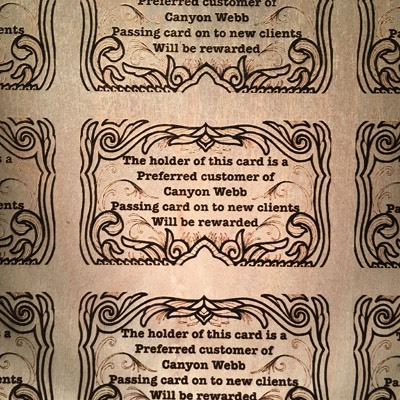 Stack of micro card stencils. 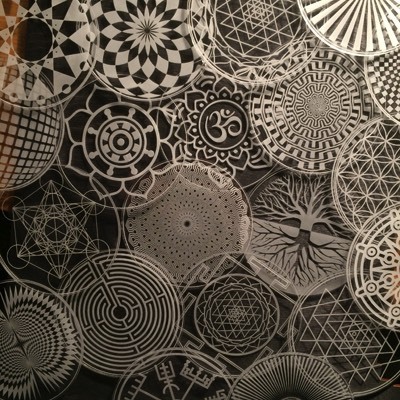 Large card stencil paper cut. Stainless steel bar blade metal marking.